Want this product quickly? Order it today and you'll get it no later than Monday 29/04/19. If you order the Cool White option, you will receive our new 4w range. Details. With a small, low cost power usage of only 3 watts, fully EU certified and featuring Mirrorstone OMNI-LED technology, the dimmable B15 3w OMNI-LED Clear Candle light is the best direct replacement for any 35w incandescent candle. With its standard B15 fitting you can easily retro fit and swap your old candles out with these and commence on making savings of up to 90% rapidly. This reduction in running costs is also complimented by the additional 5% bulk buy discount offered when buying 5 or more. Beyond these two savings, you can also get up to another 20% off of your order through one of our consistently ran discount codes making for up to a total of 25% discount before the items have even been shipped! Featuring 2 separate LED filaments which emit a high power light output and a clear glass finish, every 3w OMNI-LED candle can recreate incandescent light bulb more efficiently than any LED Bulb beforehand. These two separate filaments give the 3w OMNI-LED Candle a full 360° spread of light and a bright light output of 330 Lumens. Like our full range of B15 LED bulbs, this also incorporates Warm White (3000K) and Cool White (6000K) to give you a wide enough range to find the colour that suits you. Ordinarily, Warm White is used in living areas such as dining rooms and living rooms. It is also recommended for use in bedrooms and hallways. On top of this, Warm White is also highly recommended for use within traditionally styled rooms to compliment its decor. On the flipside to Warm White, Cool White is used in rooms that require a clearer light output such as bathrooms and kitchens. Cool White is also used in rooms with a more modern styling and decor to it. If you are still unsure on what colour temperature to choose or aren't sure on what will look best then refer to our guide. Featuring a span across all standard E27, E14, B22 & B15 fittings and available in standard Globe, Candle and Golf Ball shapes the Mirrorstone OMNI-LED range will have a something that is suitable for you. Earlier generations of LED Light bulbs used SMD LEDs to achieve their light output. As SMDs are surface mounted, the maximum beam angle the LEDs bulbs could achieve is 180°. We digitally took a first generation LED bulb apart to show the inside components and its inner workings. Where the Mirrorstone OMNI-LED range differentiate is by making use of new OMNI-LED filament technology. Unlike original SMD LED Light Bulbs, the OMNI-LED range can achieve a full 360° omnidirectional light output like traditional incandescent light bulbs. LEDs are esteemed for their capability to produce a light output equivalent to that of an incandescent bulbs whilst using up to 90% less power. This is due to the fact that incandescent lights use around 90% in heat energy so they run at ludicrously high temperatures. 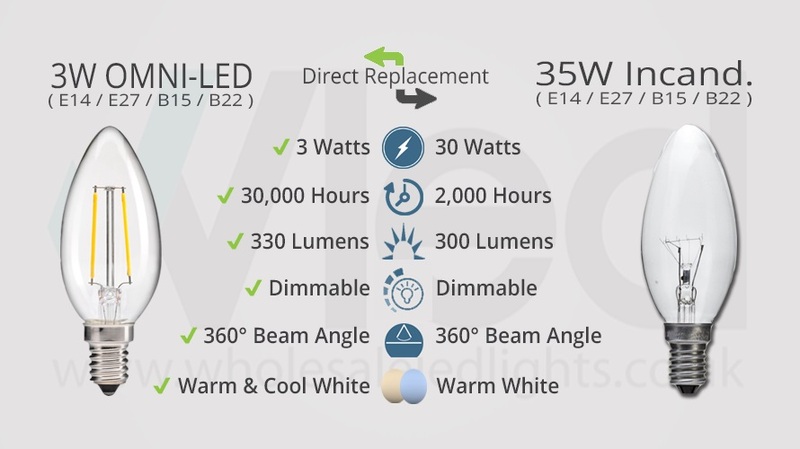 Not only can you save a large amount off of your light costs, but LEDs have a range of other benefits such as durability and even health benefits! Previously mentioned OMNI-LED technology allows for up to a 30,000 hour life span. With an average usage of 7 hours a day, these bulbs will last up to 11 years! You can have over a decade of making savings of up to 90% and without the worry of changing your light bulb. Every Mirrorstone products that we sell comes with a 2 year warranty as standard. This warranty is upgradable to a 5 year warranty free of charge, within the first 90 days of your order. This warranty is only extendable for LED spotlights, LED light bulbs and LED tape. You also get 28 days for a home trial on your items to decide if they are right for you or if they need changing, be it colour, beam angle etc. If you have any questions about the 5 year warranty, OMNI-LED technology, our wholesale prices or any other products we sell then please feel free to contact us by e-mail on cs@wled.co.uk or by telephone on 0116 321 4120. Product seems fine. The service and speedy delivery were excellent. Good bulbs. Clear light Cannot tell how long each bulb will last but am hopeful will be longer than halogen bulbs. Thee are great - clear light and attractive appearance, reasonable price, delivered swiftly in sensible packaging. Excellent product and level of illumunation is as good as conventional lighting systems. The saving in running costs is yet to be proven.